If there’s anything the last decade has taught us, it’s that no job is safe. The economy takes wild swings beyond anyone’s control, and unfortunately for most people, their only source of income is from their day job. When that reliable 9-5 disappears, they find themselves in serious financial trouble. Many millennials have or will experience problems working in a traditional 9-5 setting, whether it’s from a lack of experience, shifting job markets, or the restructuring of a company. Despite these problems, many are still looking at traditional employers as the only way to earn an income. But, that’s not all that is out there. Learning how to make money online by starting a side hustle, then growing that into a full-time work from home job, is completely attainable in today’s world. If Millennial Money Man and I can do it, I promise that it’s within your reach. The internet. That’s right, the world wide web has created an obscene amount of opportunities to work from home and has created a significant amount of wealth. All it takes is a little know-how, and the ways to generate income are endless. Resourcefulness. This generation more than any other has learned how to use their current resources to solve problems quickly and efficiently. They are not locked into one pathway and aren’t afraid to think outside of the box. And now, more than ever, having multiple streams of income is bordering on necessity. The norm, until recently, has been getting up early, driving to work, climbing the corporate ladder, and retiring there, while work from home jobs was seen as something relegated to those with less skills. This traditional mindset no longer applies. With emerging technology, companies are being forced to pivot and companies that used to be considered “safe” are being forced to downsize or close altogether. Just look at what Amazon is doing to the retail landscape. How many notable stores have you noticed announcing layoffs? These are places like Nordstrom, Best Buy, Macy’s… the list goes on and on. On the flip side, technology has made it possible to build a viable and secure living from the comfort of your home. While working for a large corporation no longer equates to job security, there are essentially endless opportunities for those wanting to start an online business and work from home. Because of the diversity of opportunities online, online business owners are able to benefit from low start-up costs to tap into a variety of markets, and all of this means you are able to create any number of work from home opportunities. Each potential job opportunity means a new income stream, and that’s where job security is these days, in diversification. When you’ve managed to acquire multiple streams of income, your job security isn’t tied to a single source. If the economy changes the revenue of one stream, you can rely on your extra income for a while. Diversification is key whether it's real estate, rental income, the stock market, or a side business. With all the new opportunities that are being formed around you daily, why not follow your passions and dreams? When thinking about what holds you back, your response is probably that you feel you are tied to a single job purely for financial reasons. Relying on one source of income to cover life’s necessities is becoming less and less of a viable option for many. But if you have several sources of income covering the basic expenses, you’re free to pursue your passions– even if they’re not particularly lucrative. This is one of the greatest benefits of having multiple income streams. The online world is full of possibilities, and you can create a viable online business and find work from home jobs that utilize your skills and interests. Whether that’s marketing, writing, finance, etc., there is a place for you in the online world. The other thing about these opportunities is that you can learn how to start an online business while you are still employed at your traditional 9-5. It will probably take working late nights and long weekends, but diversifying your income with an online business means you can eventually leave your 9-5 to pursue your side hustle even more. More than any other generation in history, millennials are known for sticking to their morals and values. This generation doesn’t compromise their beliefs for anything. So when you work for a company or group who might require a compromise, where does that leave you? You either have to sacrifice your integrity or quit. The ability to rely on yourself with online business opportunities means that you live life by your own set of morals and values. This means less stress and, ultimately, greater satisfaction. I would say this is especially true for those choosing to pursue a path that lets them work from home. Work from home jobs allow parents to stay home with their kids, they allow you to travel, and they let you build a business whose integrity is supported by your own moral code. The time to take some risks is when you’re younger, and if you’re older and reading this you probably realize how true that statement is. Investing, venturing into your own online business, or changing careers… all gets much harder once you build obligations like a home and family. Failure always looms at the back of an entrepreneur's mind, but when you’re younger, failure is less likely to have the same types of repercussions they have later in life. Plus, the more mistakes you make, the more you’ll learn. Better to get that out of the way as soon as possible. While I will admit that the younger you are, millennials I’m looking at you, the more opportunities you’ll have to take risks, the reality is that you can take risks at any age. I would never tell someone that they are too old to pursue a side hustle or work from home opportunity. However, you may just have to be more careful with how you start. Fortunately, the internet, again, makes this even easier as you can research and find opportunity in any perspective market. Building some additional income streams and starting an online business takes work and dedication– a lot of it. You must educate yourself and find the motivation to pursue some of those things. The younger you are, the easier it is to do this. This is partly because you’re less likely to have obligations that take up most of your time, and partly because, let’s face it, you need the energy to build a business. Starting an online business, take a blog for example, requires an extreme amount of dedication. While you can basically start a blog for free, there are long hours ahead of you. Success with an online business doesn’t come overnight, but the potential is 100% still there. The new Tax Cuts and Jobs Act of 2017 actually benefit those who receive income from self-employment through work from home jobs and online businesses. Business income that passes through to an individual as a sole proprietorship from a pass-through entity (like an LLC or S-Corp) receives a 20% deduction. This is subject to a maximum cap and you should review those details for further info. When you are ready to start your own online business, it’s important that you are aware and staying on top of changes in tax law– this is one area where hiring a professional can really benefit your online business. Gone are the days where you could work 20-25 years at a company with the expectation that they would take care of you until you die. Now, you need a retirement plan. I think this is difficult for many older people to understand in terms of how millennials are dealing with their long-term financial plans. We have student loan debt, the job market has changed, and we have to become more self-reliant when it comes to retirement. 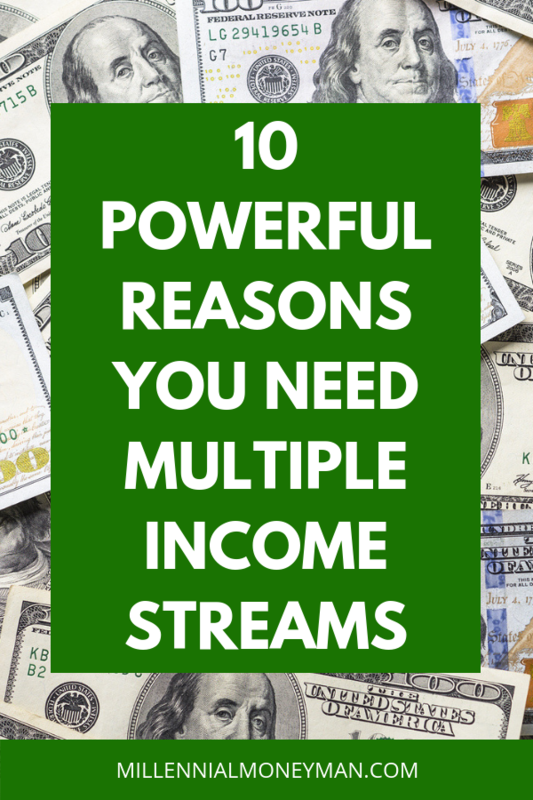 These are all reasons why creating multiple streams of income has become even more important. If you are working for a traditional company, employer contributions to your retirement fund are great, but having multiple income streams will help immensely– especially if you have the desire to retire at your own pace, rather than when your 401(k) dictates. Taking control of your future is a much more effective use of your time. In days past, once you hit a certain age, you could rely on Social Security to help pay the bills. But soon, this may not be the case. In fact, it’s entirely possible that Social Security will be depleted as early as 2035. Despite this reality, I hear from a lot of millennials who are expecting that Social Security will still be there for them once they retire. The financial safety net your grandparents or parents had will probably not be there when you hit retirement age. This is a sad but true reality. This is all the more reason why having multiple streams of income is so important. Social Security may not last, but the work you put in now with your side hustle or online business has the potential to carry you all the way through retirement. It can be difficult to think long-term when you can barely plan for the next week. But the fact is, the work you put in now with your side hustle or online business can have enormous long-term effects and capital gains. Many of the potential work from home jobs can be sustainable and scalable income generators. These are things you can start on the side of your current job, grow them to the point that you are able to leave your 9-5, grow them even more once you go full-time with your online business, and work on passive income streams. Having multiple income streams can help you build long-term wealth without having to work harder. Does it take a considerable amount of effort to get you there? Yes, 100%. I don’t want anyone to quit their job thinking that their work from home side hustle is going to be an immediate success. But, diversification and passive income streams can eventually lead to less work in the future. You can work smarter and leverage your time to achieve financial freedom earlier. Having freedom from the drudgery of trading your time for money means that you can focus on what’s really important to you– both now and in the future. Let’s put that argument aside, though, and talk about how multiple income streams will help you pay down debt. This really isn’t a hard thing to understand– the more money you have coming in means you can pay down your loans faster. This is why many people are starting side hustles, online businesses, and finding work from home opportunities. That extra income will be your ticket out of debt. If you do have a lot of debt, paying it off is incredibly liberating. It’s also vital to your financial health. The other thing, once you have that debt paid off, you can invest even more, meaning retirement doesn’t have to be something you work towards for the next 30-40 years. Millionaires, on average, have seven streams of income. They’ve learned that diversification and creating multiple streams of income is the key to long-term wealth creation. This, in turn, is the key to achieving what many people dream of: financial freedom. With any online business, though, start as early as you can. Educate yourself and do the work. Achieving financial freedom is very possible, and if you can do it, you can live life on your on your own terms. When it comes to living on your own terms… the sooner the better. Passive Income MD is a physician who has achieved financial freedom from his day job through passive income streams. He blogs about his journey in hopes to help others achieve the same. He still continues to work part-time, however, because he loves what he does. I love the ‘paying down debt’ thing and think it’s a great use of side hustle $$. I love having multiple streams of income. I also like their limitless potential – even though right now my day job makes the most money and pays the bills, there’s a chance that one of my income streams could dwarf my day job. That makes those income streams that much more thrilling! Spot on Doc! This post is perfect in that it covers all of the benefits of having a side hustle. I do find it funny coming from an MD though. Considering that MD’s are highly paid, spending time to make money at anything other than working in medicine seems a little inefficient. Do you have a side hustle that takes advantage of your education? Despite our high incomes there definitely are benefits to physicians spending time on side gigs and income streams. Doctors are increasingly employed by hospital networks rather than owning their own practices. That results in little opportunity to build equity or get tax deductions. The retirement fund options are limited. Also, if you have one employer as your only income, you have reduced negotiating ability. Because of that, your employer can require you to work more hours and to see more patients per hour. Without FI you have reduced negotiating clout. This is a contributing factor to the pervasive problem of physician burnout. Two thumbs up for #5. A lot more energy is required to get things moving. Start when you have fewer obligations and more free time. Get those income streams built early and they will require less maintenance in the long run. The compound effect is amazing like that. Great list, Passive Income M.D. There is another side too, for a gifted few (like doctors)the 9 to 5 can provide tremendous wealth, my former CEO got the job at 31 and has made tens of millions in compensation since then. You can’t reach his level of excellence, or mine for that matter unless you focus on one thing with most of your energy. Having multiple parallel gigs has all the benefits you mentioned but unless they are closely related you are also almost locking in mediocrity in several things versus excellence in one. I made a lot of money in the corporate world before I retired early and set up my five side gigs. They are fun, profitable, part time and I am good at them but I’ll never be world class because I won’t devote enough time to any one of them to get there. That is fine for my retirement because I also have a lot of volunteer work that matters but I wouldn’t be where I am now if I had tried to manage side gigs while I was a corporate exec. The majority of my colleagues/friends still refuse to save, or contribute money towards their 401(k)’s. They say I am crazy for putting all the money that I do away, yet never seem to tell me how they are going to save for their retirement. I am not sure if the majority just think their company’s will fund their retirement (via pension) when they get old enough, but that type of pension dream is long gone. It’s all on YOU for establishing your own retirement now. It doesn’t seem to hit most people until their later years, and then they eventually regret the decisions they made in their 20’s & 30’s. I have been a believer in having side gigs and multiple income streams for the last 20 years. Because of that -despite a variable savings rate, no budgeting, and investment blunders galore – I achieved FI. I’m not dependent on my job for income. I work part-time now. I still like it and I enjoy the benefits, work, and paychecks. Most of us find that all kinds of options open up when you have FI. I believe your statement “In fact, it’s entirely possible that Social Security will be depleted as early as 2035. ” is false. It is expected at that time they will only be able to pay out 80% of what was promised. Not fully depleted.